The level of heat in this soup mostly comes from the peppers so if yours are particularly spicy, you may want to only add in half of the jalapeño. However, for even more heat, leave in some of the seeds from both peppers. Make tortilla strips. Brush a thin layer of oil onto a baking sheet. Brush one side of each tortilla with enough oil to lightly coat. Cut each tortilla into 1/4-inch strips (cutting longer strips in half) and place oiled side up on prepared baking sheet. Bake until lightly golden brown, turning occasionally, 5-10 minutes. Remove and set aside. Allow baking sheet to cool slightly to use for chicken. Place chicken breasts on baking sheet and rub skin of each with enough oil to cook and season each with salt and pepper. Bake for 30-35 minutes, until chicken is cooked through. Set aside to cool. In a Dutch oven, add 2 tablespoons oil over medium heat. Add onion, poblano and jalapeño peppers and cook until softened, about 10 minutes. Season with salt and pepper. Add garlic, tomato paste, cumin, and chili powder and cook for another minute. Add stock and bring to a boil. Reduce heat to low and simmer for about 10 minutes. Meanwhile, remove chicken meat from bones, shred, and discard skin and bones (you should have about 2 cups shredded chicken). Add shredded chicken to pot and allow to warm through, about another 10 minutes. Cut avocado(s) in half, remove and discard pit(s) and scoop out flesh. Dice and set aside. 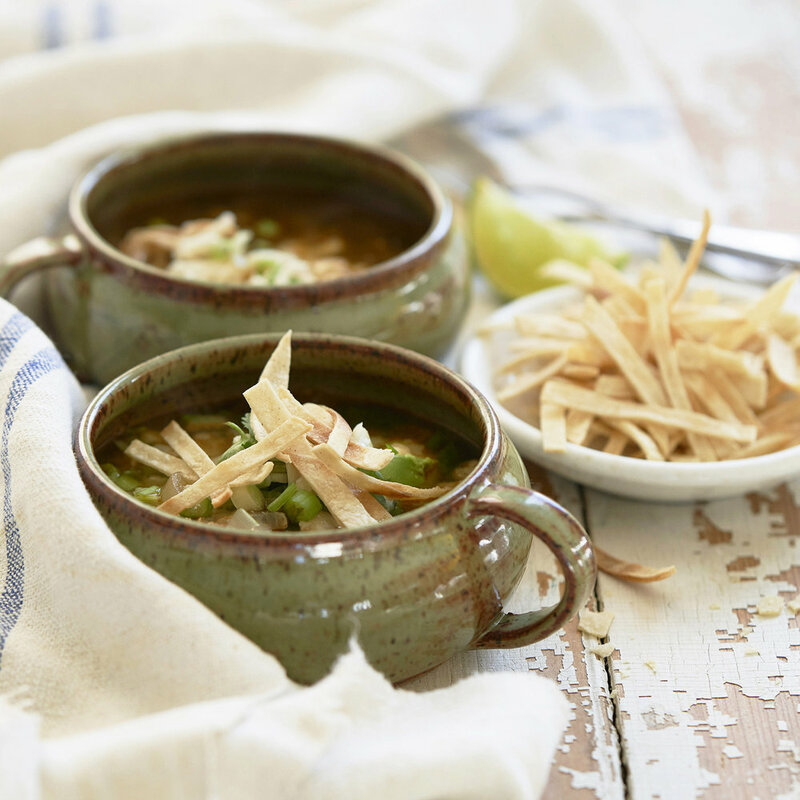 When soup is warmed, spoon into serving bowls and top with avocado, scallions, cilantro, and cheese. Top with tortilla strips and serve warm with limes.